Apparently because shared bicycles aren’t enough of a challenge, Nanjing has decided to embrace shared cars. According to a report on Tuesday, 200 Chery eQ electric cars will be available through Gofun Chuxing (Gofun 出行--a Beijing-based state owned firm already in 4 Chinese cities) for use by anyone with a driver’s license and identity card and a 699 yuan deposit by the end of April. Many vehicles will be based at subway stations, while others will be parked at business centers, software and innovation parks, university campuses, and the city’s historical and tourist sites. Prospective users will do much the same as they do for share-bikes: download the app; locate where the nearest car is parked; use their phone to scan and unlock the car lock. Charges will be based on the length of time the vehicle is used and the kilometers traveled. Coupons and other discounts will be offered, mirroring the current bike-sharing situation, where price wars are growing increasingly common. 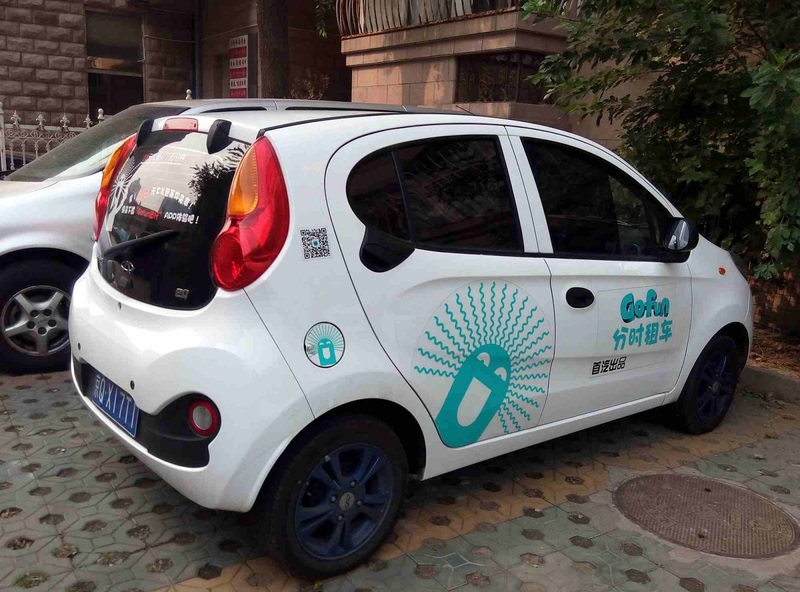 But what’s different is that unlike the private bike-share business that burst upon Chinese cities this year far faster and deeper than spring itself here, the car-share program is a direct outgrowth of the Nanjing city government’s plan to deal with traffic problems. Last year, Nanjing issued a “New Energy Vehicle [新能源汽车] Promotion and Application Program" document which urged the expansion of charging stations in residential compounds, hotels, commercial areas, tourist attractions, institutions and enterprises, and the allocation of free parking electric and hybrid cars. Nanjing officials recognise that they can’t halt migration into the city from the countryside and its concomitant social effects: Their primary purpose in programs such as this one is to prevent educated and affluent residents from moving elsewhere. Offering a variety of government-sponsored services designed to address citizen needs—and their complaints--is a major part of that strategy. Nanjing knows that economic growth only goes so far these days. So this is local policy generated locally, not firms parachuting into Nanjing and acting as grassroots agents for economic growth in place of the State. Call it “Small Socialism”—providing ways and means for State authorities to tackle sudden entrepreneurship locally. If there’s sharing in this new shared-economy, government officials want to be the visible hands offering and regulating it, ruling the roads it builds. To that end, Tuesday’s news report reveals a somewhat defensive tone in announcing this shared-car venture, probably because the local government is concerned about objections and problems to come, and has had some experience in previous months with initiatives that didn’t quite flower. For example, the article admits that while “from sharing bicycles to sharing cars, the sharing economy bring conveniences to the lives of ordinary people, the arrival of the new economy is often ahead of existing infrastructure and regulations, and producing new issues to those managing the city.” Car-sharing ventures in China currently are at best breaking even, according to the piece. While there is demand from students and recent graduates, tourists, enterprises and work-units, the real profits are likely to be found through other means, such as advertising on the cars being driven, financing, insurance and other value-added services [增值业务] increasingly associated with “Big Data”. Decreasing the carbon tire-print of cars is one goal, but making money is obviously another. One foundation for a successful program could well be the availability of free parking for shared-cars, because that facilitates access for likely users and improves the turnover rate. 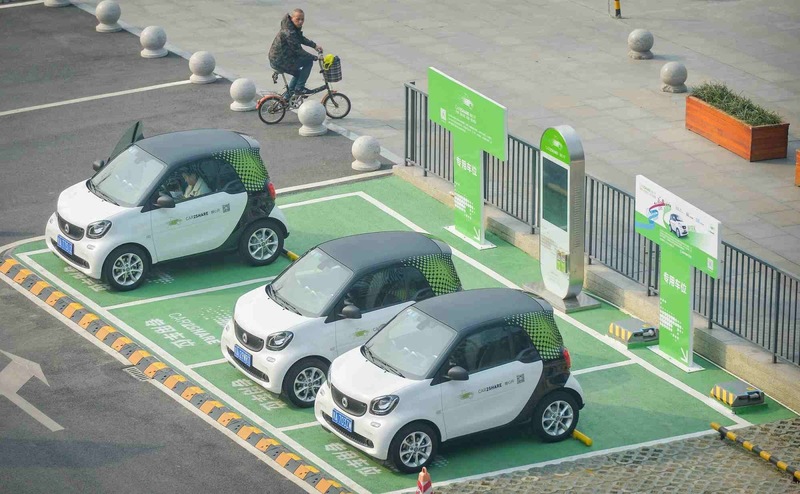 With only 40 of those sites in operation currently (and many of those on the city periphery), Nanjing government is looking into subdividing some of the high-use parking facilities downtown (and at the rail stations and airport) into free slots for electric and hybrid cars. (High parking fees in locations handicapped two car-sharing companies that were trialled in Nanjing last year.) Creating areas where residents can rent a bicycle (or motorcycle) and also transfer to an electric car might be one way forward, the article notes--and it may help to reduce traffic congestion brought about by more vehicles on the city’s many narrow avenues. There are other obstacles, including convincing potential customers that there aren't steep downsides. For example, one resident interviewed did acknowledge that while he found the option of a shared-car inviting, he worried about what to do if there was an accident or a traffic violation in the car he would be driving. The piece contended that the new venture would be offering a non-deductible insurance policy for customers, while urging drivers to deal with any violations and fines themselves. How that component of conduct will be incorporated into the fast-expanding data collection part of Nanjing’s urban management system isn’t being made clear. In so many ways here, local officials in China are still working on the rules of the road.